I would love to take my dog Pepper to work with me. When she was 11 weeks old I was allowed to bring her to work but that only lasted for a few days. More companies are understanding the importance of work and life balance and how it effects retention. A happy employee not only will stay with the company but becomes the best recruiter. Some companies have a policy in place that allows you to take your dog to work once or twice a month. This is a great idea because not only does it show other people who don’t have a dog or cat how great it is to own a pet but it encourages pet owners to raise an obedient pet. I know many friends who’s dogs are so badly trained that they wouldn’t even bring them into work if they were allowed. Before getting excited and checking out what the policy is at your work you have to remember that your dog needs to be trained and very obedient. Respect your co-workers. You should find out if all the employees you work with are comfortable with dogs being in their space. Dog-friendly environment. Is your workplace safe for your dog? What will your dog be exposed to? 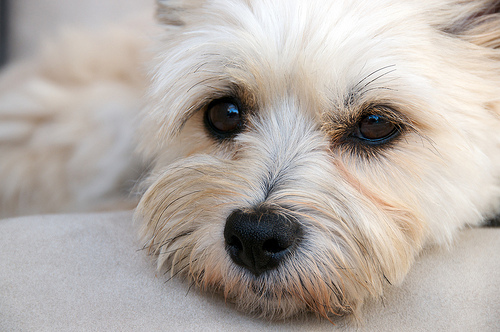 New people, new sights, sounds, smells, chemicals and equipment can make a dog anxious. The outside environment. Is there somewhere you can walk your dog or play fetch? Where will your dog use the washroom? Where will you dispose of your dog’s waste? Dog office etiquette. What behaviors should your dog know? Most likely they will need to know the basics: sit, stay, down. If your dog has never been in an office for a whole day it’s best to take some practice runs. I remember taking Pepper in for a few hours each day. This allowed her to meet my co-workers and start to get comfortable sitting near me while I worked. This also allowed me to get used to having her around. I started to train her that she gets a few breaks to go outside and do her business. Planning and creating a routine with your dog allows them to relax and feel less anxious. When I started with VANOC I asked if I was able to bring my dog to work with me. Unfortunately, they did allow pets in the workplace but had changed the policy a few months earlier due to some misbehaved dogs. Owners need to understand that the workplace is not the dog park and coworkers are not dog sitters. Many people can abuse this policy and ruin it for dog owners who have well behaved pets. Having your dog with you at work is so much fun not only for the owner but for the office. 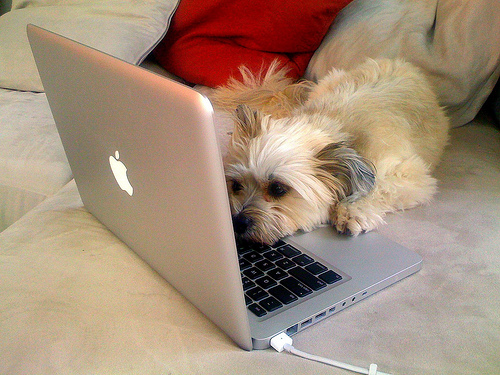 Pets can really boost morale and when employees are happy they are more productive and use less sick time. It’s too bad some people ruin it for others with misbehaved dogs. Also, how cute is Pepper in these photos?! I miss that little bugger.